An example of the first objective is the project reported by Aston University in Birmingham, England where researchers are using biological cells to create "neurospheres" (small clusters of neurons) in order to develop new treatments for diseases including Alzheimer's, motor neurone and Parkinson's disease. The second objective is a reply to arguments such as John Searle's Chinese room argument, Hubert Dreyfus' critique of AI or Roger Penrose's argument in The Emperor's New Mind. These critics argued that there are aspects of human consciousness or expertise that can not be simulated by machines. One reply to their arguments is that the biological processes inside the brain can be simulated to any degree of accuracy. This reply was made as early as 1950, by Alan Turing in his classic paper "Computing Machinery and Intelligence". The third objective is generally called artificial general intelligence by researchers. However, Ray Kurzweil prefers the term "strong AI". In his book The Singularity is Near, he focuses on whole brain emulation using conventional computing machines as an approach to implementing artificial brains, and claims (on grounds of computer power continuing an exponential growth trend) that this could be done by 2025. Henry Markram, director of the Blue Brain project (which is attempting brain emulation), made a similar claim (2020) at the Oxford TED conference in 2009. 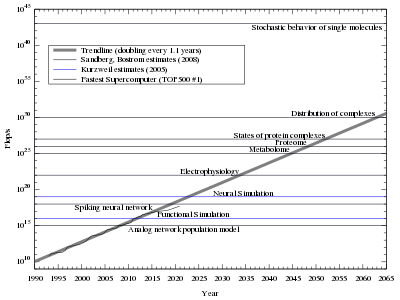 Estimates of how much processing power is needed to emulate a human brain at various levels (from Ray Kurzweil, and Anders Sandberg and Nick Bostrom), along with the fastest supercomputer from TOP500 mapped by year. Although direct human brain emulation using artificial neural networks on a high-performance computing engine is a commonly discussed approach, there are other approaches. An alternative artificial brain implementation could be based on Holographic Neural Technology (HNeT) non linear phase coherence/decoherence principles. The analogy has been made to quantum processes through the core synaptic algorithm which has strong similarities to the quantum mechanical wave equation. EvBrain is a form of evolutionary software that can evolve "brainlike" neural networks, such as the network immediately behind the retina. In November 2008, IBM received a US$4.9 million grant from the Pentagon for research into creating intelligent computers. The Blue Brain project is being conducted with the assistance of IBM in Lausanne. The project is based on the premise that it is possible to artificially link the neurons "in the computer" by placing thirty million synapses in their proper three-dimensional position. Some proponents of strong AI speculated that computers in connection with Blue Brain and Soul Catcher may exceed human intellectual capacity by around 2015, and that it is likely that we will be able to download the human brain at some time around 2050. While Blue Brain is able to represent complex neural connections on the large scale, the project does not achieve the link between brain activity and behaviors executed by the brain. In 2012, project Spaun (Semantic Pointer Architecture Unified Network) attempted to model multiple parts of the human brain through large-scale representations of neural connections that generate complex behaviors in addition to mapping. Spaun's design recreates elements of human brain anatomy. The model, consisting of approximately 2.5 million neurons, includes features of the visual and motor cortices, GABAergic and dopaminergic connections, the ventral tegmental area (VTA), substantia nigra, and others. The design allows for several functions in response to eight tasks, using visual inputs of typed or handwritten characters and outputs carried out by a mechanical arm. Spaun's functions include copying a drawing, recognizing images, and counting. There are good reasons to believe that, regardless of implementation strategy, the predictions of realising artificial brains in the near future are optimistic. In particular brains (including the human brain) and cognition are not currently well understood, and the scale of computation required is unknown. Another near term limitation is that all current approaches for brain simulation require orders of magnitude larger power consumption compared with a human brain. The human brain consumes about 20 W of power whereas current supercomputers may use as much as 1 MW or an order of 100,000 more. Some critics of brain simulation believe that it is simpler to create general intelligent action directly without imitating nature. Some commentators have used the analogy that early attempts to construct flying machines modeled them after birds, but that modern aircraft do not look like birds. ^ (in English) Jaap Bloem, Menno van Doorn, Sander Duivestein, Me the media: rise of the conversation society, VINT research Institute of Sogeti, 2009, p.273. ^ a b , A Large-Scale Model of the Functioning Brain. ^ Goertzel, Ben (December 2007). "Human-level artificial general intelligence and the possibility of a technological singularity: a reaction to Ray Kurzweil's The Singularity Is Near, and McDermott's critique of Kurzweil". Artificial Intelligence. 171 (18, Special Review Issue): 1161–1173. doi:10.1016/j.artint.2007.10.011. Retrieved April 1, 2009.